It's time for another Crafty Critters Challenge! This is Challenge #19 - Valentine with a twist. 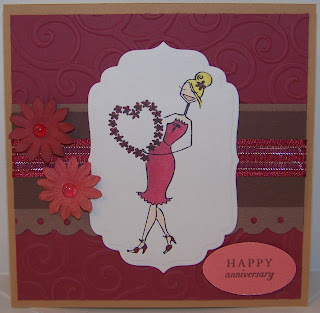 It was to make a valentine card without using the traditional pink and red, at least 2 layers, and 2 different embellishments. I stretched it a little bit and made this into an anniversary card. Supplies are image from Stamping Bella colored in with Copics, nestabilities frame, PTI Mixed Messages (sentiment), misc embellishments. Paper is SU Creamy Caramel, Close to Cocoa, Chocolate Chip and Baroque Burgundy, and the other pink is DCWV. Lovely card! All the layers look great and cute Bella! Lovely card! I like all the layers. Hugs! Oh so sweet, love it! I used a Bella for my card too...again...great minds think alike!! Oh, what a lovely card! I love that embossed background and the nesties you used. I really like the colours on this card! Very pretty, love the embossed background!